Sutherland, JM. Hospital Payment Policy in Canada: Options for the future. Canadian Health Services Research Foundation, 2011. Wolfe PR, Moran DW. Global budgeting in the OECD countries. Health Care Financing Review, 1993. Canada`s healthcare system is predominately public, with 70% of healthcare funding coming from the public-sector and the remaining 30% from the private-sector (Canadian Institute for Health Information, 2016). It is estimated that health spending in Canada will be $228.1 billion in 2016, or approximately 11.1% of GDP, the majority of which goes to hospitals (29.5%), drugs (16%) and physicians (15.3%) (Canadian Institute for Health Information, 2016). Since 2005, physician compensation as a portion of total health spending has increased but since 2014, the share has slowed and is now maintaining levels comparable to those of the late 1980s (Canadian Institute for Health Information, 2016). Spending on healthcare varies across Canada, but on average provinces spend approximately 38% of their total budgets on healthcare (Canadian Institute for Health Information, 2016). Per capita spending in 2016 for all of Canada is projected to be $6,299, but spending by province ranges from $5,822 in Québec to a high of $7,256 in Newfoundland and Labrador (Canadian Institute for Health Information, 2016). 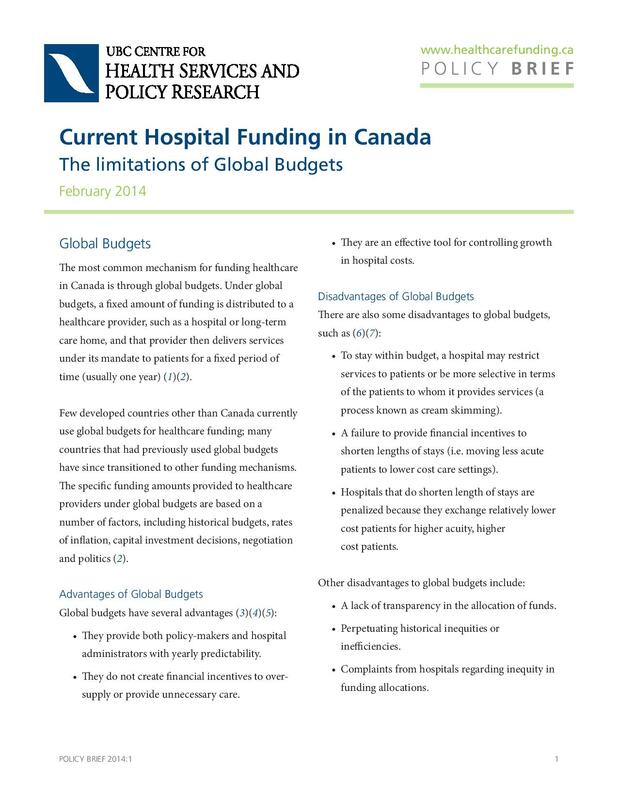 The most common healthcare funding method in Canada is global budgets, where a fixed payment amount is allocated to a provider (such as a health authority or a hospital) to cover operating expenses for a period of time, usually one year. In most Canadian provinces, healthcare services are regionalized, and local or regional health authorities hold primary responsibility for delivering healthcare services. In most provinces, governments allocate funding to health authorities through a global budget, and many health authorities, in turn, use global budgets to fund specific groups of services. In Canada, most hospitals, long-term care facilities, publicly-funded rehabilitation facilities and mental and public health programs are funded under global budgets (Sutherland et al., 2013). Funding amounts are typically based on factors such as historical budgets, inflation and politics, and are provided irrespective of the number of patients or levels of demands on resources (Sutherland & Repin, 2012). Global budgets can be an effective means to control healthcare expenditure growth through the use of spending “caps,” and they also provide financial predictability for administrators and policy-makers (Wolfe & Moran, 1993; Antioch & Walsh, 2004). One weakness of global budgets is that, under the impetus to meet budget targets, providers might restrict access to services or limit the number of admissions to facilities. Moreover, global budgets provide little incentive for innovation or to improve efficiency of care (Sutherland & Crump, 2011). Since global budgets do not provide opportunities for increased revenue if patient throughput increases, healthcare providers have no incentive to shorten patient lengths of stay or to discharge patients to lower cost healthcare settings (Sutherland et al., 2013). Global budgets do not promote coordination across service providers in acute and post-acute settings, creating a fragmented healthcare system that is often associated with inefficiencies and reduced quality of care (Sutherland & Crump, 2011; Sutherland & Repin, 2012). Most of the countries that had previously used global budgets have since transitioned to other funding mechanisms, such as activity-based funding (ABF) (Sutherland & Repin, 2012; Sutherland, 2011). In recent years there has been a shift towards changing how healthcare in Canada is funded, and experimentation with various healthcare funding policies have been initiated in provinces such as British Columbia, Alberta, Saskatchewan, Manitoba, Ontario, and Quebec (Sutherland & Repin, 2012).